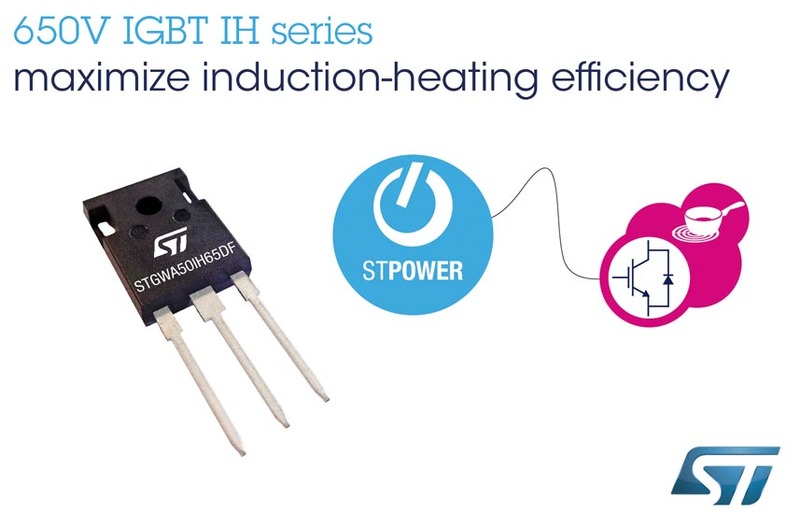 Optimized for best conduction and switching performance in soft-switching circuits, STMicroelectronics’ STGWA40IH65DF and STGWA50IH65DF 650 V STPOWER™ IGBTs increase the energy efficiency of resonant converters in the 16 kHz-60 kHz switching-frequency range. Extending ST’s trench field-stop IGBTs for soft-switching applications, which also include the HB and HB2 series for power supplies, welders, and solar converters, the new IH-series devices are fine-tuned for the half-bridge circuits of appliances such as induction cookers and other soft-switching applications. Product designers can now choose these IGBTs to target superior energy ratings. Rated for 40 A and 50 A respectively, the STGWA40IH65DF and STGWA50IH65DF serve applications up to 4 kW. With low saturation voltage (VCE(sat)) of 1.5 V (typical at nominal current) and a low-drop voltage freewheeling co-packaged diode, these advanced IGBTs combine outstanding conduction performance with low turn-off losses of just 0.19 mJ (typical) in the 40 A STGWA40IH65DF. IH-series IGBTs are specified up to the maximum junction temperature of 175 °C, and feature low thermal resistance and a positive temperature coefficient of VCE(sat) for enhanced reliability. The STGWA40IH65DF and STGWA50IH65DF IGBTs are available now in the TO-247 long-lead power package. ST will add 20 A and 30 A variants soon, in TO-247 long lead and TO-220 packages.